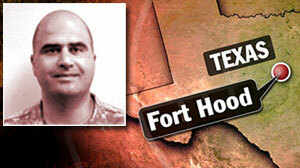 The suspected gunman in the shooting at Fort Hood, Texas, has been identified as Army Maj. Nidal Malik Hasan, a psychiatrist trained by the military. U.S. intelligence agencies were aware months ago that Army Major Nidal Malik Hasan was attempting to make contact with an individual associated with al Qaeda, two American officials briefed on classified material in the case told ABC News. According to the officials, the Army was informed of Hasan's contact, but it is unclear what, if anything, the Army did in response. Rep. Peter Hoekstra (R-MI), the ranking Republican on the House Intelligence Committee, said that he requested the CIA and other intelligence agencies brief the committee on what was known, if anything, about Hasan by the U.S. intelligence community, only to be refused. In response, Hoekstra issued a document preservation request to four intelligence agencies. The letter, dated November 7th, was sent to directors Dennis Blair (DNI), Robert Mueller (FBI), Lt. Gen Keith Alexander (NSA) and Leon Panetta (CIA). Hoekstra said he is "absolutely furious" that the house intel committee has been refused an intelligence briefing by the DNI or CIA on Hasan's attempt to reach out to al Qaeda, as first reported by ABC News. "This is a law enforcement investigation, in which other agencies—not the CIA—have the lead," CIA spokesman Paul Gimigliano said in a response to ABC News. " Any suggestion that the CIA refused to brief Congress is incorrect." Investigators want to know if Hasan maintained contact with a radical mosque leader from Virginia, Anwar al Awlaki, who now lives in Yemen and runs a web site that promotes jihad around the world against the U.S. In a blog posting early Monday titled "Nidal Hassan Did the Right Thing," Awlaki calls Hasan a "hero" and a "man of conscience who could not bear living the contradiction of being a Muslim and serving in an army that is fighting against his own people." According to his site, Awlaki served as an imam in Denver, San Diego and Falls Church, Virginia. The Associated Press reported Sunday that Major Hasan attended the Falls Church mosque when Awlaki was there. The Telegraph of London reported that Awlaki had made contact with two of the 9/11 hijackers when he was in San Diego. He denied any knowledge of the hijacking plot and was never charged with any crime. After an intensive investigation by the FBI , Awlaki moved to Yemen. People who knew or worked with Hasan say he seemed to have gradually become more radical in his disapproval of the war in Iraq and Afghanistan. On Sunday, Sen. Joseph Lieberman (D-CT) called for an investigation into whether the Army missed signs as to whether Hasan was an Islamic extremist. "If Hasan was showing signs, saying to people that he had become an Islamist extremist, the U.S. Army has to have a zero tolerance," Lieberman told Fox News Sunday. A fellow Army doctor who studied with Hasan, Val Finell, told ABC News, "He would frequently say he was a Muslim first and an American second. And that came out in just about everything he did at the University." Finell said he and other Army doctors complained to superiors about Hasan's statements. "And we questioned how somebody could take an oath of office…be an officer in the military and swear allegiance to the constitution and to defend America against all enemies, foreign and domestic and have that type of conflict," Finell told ABC News. "I think the speculation (on Hasan's Islamic roots) could potentially heighten backlash against some of our Muslim soldiers," he said on ABC's "This Week."